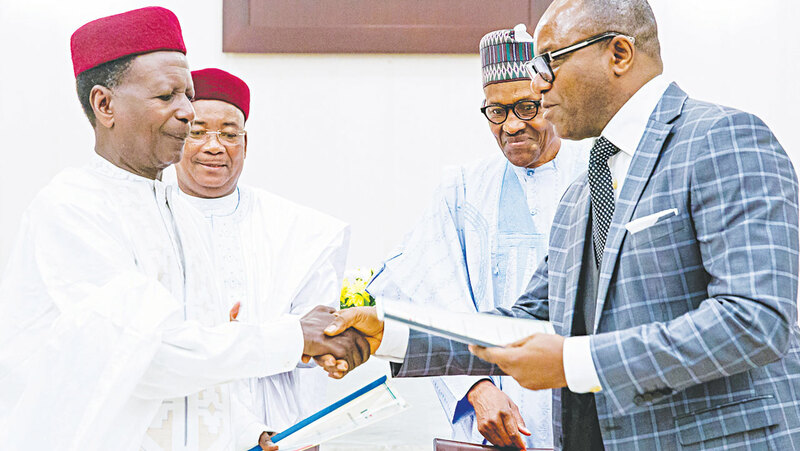 Home Business Commentary: Why President Buhari wants to build US$2 Billion Refinery in Katsina with Pipelines from Niger Republic. Commentary: Why President Buhari wants to build US$2 Billion Refinery in Katsina with Pipelines from Niger Republic. Why President Buhari wants to build US$2 Billion Refinery in Katsina with Pipelines from Niger Republic. President Mohammadu Buhari did not find any of the Oil and Gas producing States in the Niger Delta to build a refinery, but rather he took it to his own State Katsina? What a pity! You mean the the Oil here will now have to be drilled and transported far to the North for refining? This is Sectionalism, ethnic bigotry, Northernalization and regional interest taken too far. Even if I have hundreds of reasons to support him for a second term, this particular act is enough reason to withdraw my support. Funny enough, some of the Niger Delta youths who are jobless and would have benefitted from this refinery being established in their regime are still telling us Bubari for continuity. May God have mercy on them. Like what I have always pontificated, I will be forgiven for supporting PMB in 2015 because I was deceived by history of the personality of who this man really is and the desire to ensure Jonathan does not return ,but history will not forgive me again if after knowing the real person of PMB and still decide to support him for another four years of disaster. Nigeria may stop to exist if he comes back for a second term. All true patriots in Nigeria no matter their political affiliation must come together to rescue it before it is too late. Meanwhile, those wondering why US$2 Billion is being yanked off the Treasury of Nigeria by the Caliphate-Controlled “Federal Government” under Muhammadu Buhari, to build a Refinery in Katsina with Pipelines from Niger Republic or why Railways and massive Road Infrastructure are being constructed in that same axis, should read the post below. CALIPHATE PREPARATIONS FOR THE DAY AFTER ONE-NIGERIA IF COLONIZATION PLOT FAILS. The Fulani Caliphate knows that decisive and irreversible steps are being taken by the entrapped constituent components of the defunct Nigerian Federation (which collapsed since 1966) to dissolve and dismantle the dead Union into viable, cohesive units of successor-states according to the Broken Map we have seen here a number of times. Their Plan A was to forcefully seize the entire Territorial Space by raw Conquest for which reason they marauded their way to power, using the Boko Haram Militia. Once in power, the BH machinery was rebranded and redeployed as Fulani Herdsmen to get on the task of a sweeping Southward mission of Conquest which has already overrun the Upper Middle Belt that include Southern Kaduna/Plateau/Taraba and now gyrating vigorously in Benue where heavy resistance is building up, with moral support and solidarity from the rest of the South. The Caliphate Plan B was to get themselves prepared for the day after One-Nigeria taking to their side whatever could be taken from the rest of Nigeria- Oil/Gas US$Billions, Customs/NPA rentals, Company Taxes and VAT proceeds. Then, heavy International borrowings in the name of "Nigeria" but the Projects are in the Green Belt according to the MNN Broken Map. The World Bank Projects were specifically commandeered to the North East flank of the Green Belt. From these hijacked pool of funds, we have seen massive agro-investments in the Green Belt; Massive Road and Rail Investments; we saw massive Power Generation initiatives in Green Belt; we saw the massive upgrade of the Kaduna Airport which was accompanied by the shut-down of Abuja Airport (this was a ploy to introduce the International Business Community to the Kaduna Airport in readiness for that new Economic hub the Caliphate was creating further North and to help extirpate the Boko Haram insecurity halo that hung on the whole of the North). We saw the 1000 km Crude Oil Pipeline Contract from Niger to Kaduna Refinery. We now see the proposed Katsina Refinery on the border with Niger Republic. We see this new Rail Infrastructure in the same Katsina-Niger Republic axis. I could list 20 more such. The huge Public Funds being expended come exclusively from the South, as well as foreign borrowings that are guaranteed by Southern Assets, particularly Oil/Gas and it takes the most naive amongst us not to see the elaborate, massive Asset Stripping of the failed One-Nigeria Enterprise by the Caliphate. The tragedy of the situation however is the inability of the South and the MB to see these deft moves by the Caliphate which continues to hoist the 2019 Elections to hypnotize the rest of Nigeria into deeper slumber where all dreams revolve around PVC while the Caliphate is wide awake, stockpiling and freely deploying AK47 to drive their PLAN A of Conquest and Colonization as far as it can go as that guarantees for them, a smoother Transitioning or even Swith-Over to their PLAN B of surviving on their own the day after One-Nigeria, leaving the rest of us with damaged Society, Infrastructure, Mortgated Economic Assets and huge Foreign Debts. To up the potency of the 2019 hypnosis, the Caliphate just poured the opium of Restructuring and already, untrained eyes from the South and MB are celebrating the Trojan of Consensus on Restructuring which the new Restructuring song from the Caliphate represents. It is clear to everyone of us now that Election will not resolve jinxes of Nigeria. Commonsense demands that we halt all further dissipation of energies on permutations around how best to approach the Elections. Ditto for the hoax of Restructuring which the Caliphate is already railroading to their "National Assembly". The dangerous descent into the HIGHWAY TO RWANDA where we have been plunged by the Caliphate, presents the rest of Nigeria with limited options and even more limited luxury of time and we are talking of stark Death or Life choices here. The best bet for the rest of Nigeria is to shake up the Caliphate spell and brace up for the urgent self-redemption imperative. My Proposal on how to proceed on this task with things that are entirely in our own hands to do, and immediately too, is contained in the LNC Public Communication, titled "THE BATTLE FOR THE CARCASS OF NIGERIA BETWEEN CALIPHATE COLONIALIST AND ENTRAPPED REGIONS: THE BRIDGE TO 2019 HOLDS THE ACE " dated January 27, 2018 now reposted here.